Goins will play for KAO Dramas. Melvin Goins(1.80-PG) will be the latest addition of A1 hopefuls KAO Dramas according to sport24.gr. The point guard of the Tennessee Volunteers will play in the same league as former teammate Scotty Hopson(2.01-SF) that plays for Kolossos Rhodes. KAO Dramas is one of the teams with the smallest budget in the league and their main goal at this stage to secure their place in next season's A1. Goins will be in Greece tomorrow evening in order to become part of the team as soon as possible so that he gets a chance to play in this weekend's game against Aris BC. Goins will be helping veteran Sakis Karidas(1.85-PG) in the point guard position. He also confirmed himself via Twitter that he will be playing in Greece. 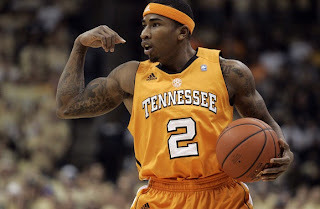 Goins finished the season for Tennessee averaging 8.1 points 2.8 rebounds and 3.1 assists in 33 games. Olympiacos to sign George Hill? Dimitris Tsaldaris returns to Aris?